Let’s be honest, the salon is the first place that pops to mind when you think about how to thread your eyebrows. Sadly, this isn’t always feasible. There come times when you need to thread those brows yourself if you are to look at all presentable for auditions, presentations, a crucial date, or receiving your mother-in-law, emergencies, etc. Gather the materials you will need and take them with you to your "mirror on the wall". Remember those tiny scissors you never really had a clue what to do with? Get those to go. Some loose powder, a thick piece of thread (a spool, in case you need to take a few fresh cuts), and don’t forget some face astringent, a pencil, scale (30 inches), some ice or cold water. The ice or cold water is to help numb the area, surprise, surprise, eyebrow-threading hurts a little. The pencil is to keep you from making a disaster in the shaping process. In addition, the astringent will come in handy, trust us. How to thread your eyebrows? Start with making a loop out of your thread. Use the scale to mark and cut a length of thread about 15-20 inches. Use the scissors to cut this portion before you make a loop and knot the two ends together. Make tight knots at this point, about three to four, to ensure a strong loop. If there is excess thread beyond the knotted clump, snip those off to make your next step easier. Take hold of the thread with the knot in one hand and use your other hand to grip the other section of the loop. Twist the thread loop using the hand that doesn’t contain the knot. With the other hand held steady (so the knot doesn’t get entangled in the middle), twist about six times. You’ll notice the center skew tight, leaving you with an infinity-symbol (or hourglass) loop design. Your fingers should be present on the inner side of each loop. Thread by spreading two fingers of one loop apart (vertically) and narrowing the two fingers inside the other loop. And vice versa. Practice this a couple of times. This "scissor action" encourages the twisty center of the loop to remove stray eyebrow hairs. Apply some compact powder on your eyebrows to help hair and thread make contact without slipping. This step isn’t as tricky as it seems. With fingers facing away from your face, hold the loop so the twisted central area is at the eyebrows. Notice the sharp triangle point on the inside loop as you stretch your fingers apart on the other. This action will scissor-cut the hair that strays from the penciled outline you should have (obviously) done by now. How to thread your eyebrows in the right direction? Here comes the tips. Go against the direction of hair growth. The triangle point will therefore go from outside in (towards the middle of the forehead). With the inner loop (triangle cutter) fingers held close, the outer loop fingers stretch vertically up-down-up-down to perform the cutting action. When the stray hair is caught in the triangle point, swiftly make the opposite motion (inner loop fingers stretch apart and outer loop fingers come close) and the hair comes off. With the other brow, the cut-triangle will certainly change in direction. Don’t be frightened; this is a work in progress and practice does help. After all these painful work, take those small scissors and trim away any excess - light work. Apply some astringent after you get the shape you want. Neatness, elegance, beauty... Your eyebrows should exude an aura when people see you. Here are some uesful tips to help you stay confident before and after eyebrow threading. It’s perfectly normal to see a little post-threading redness. This entirely natural reaction is unavoidable. After a few hours, the redness will alleviate or disappear altogether. If you feel the burn, a cool compress will help. A professional brow shaper, especially one whom you can trust, is worth your time. You gain said trust by getting to know them better, so ask after licenses, where they are trained, and their experience. No brow razors! So your appointment is delayed. If you end up "shaving" the hair in question it will grow back rougher and coarser. Risks include stubble, in-grown hair, and shaving to much off by mistake. Applying anything after eyebrow shaping other than recommended astringents is a bad idea. Keep your beauty-crazed mitts off those cleansers, moisturizers, and makeup. Wait a couple of hours before applying anything to the threaded section. This will otherwise open room for bacterial infections because the pores around your eyebrows stay open for a while post-threading. Thread every TWO weeks. This beautician-recommended practice helps your eyebrows stay sharp and clean and prevents hair from growing back efficiently. Talk to your expert, even to yourself if you know how to thread your eyebrows at home. Use photos, face-shape match-ups, and discuss ideas on what new shape will suit your face. Not everyone can get away with a celeb-inspired brow. Yours could be better, if done right. Which eyebrow shape will suit your face? In fact, which one will make YOU gorgeous? The shape of your face will determine this more than any other facial feature. Remember having bad hair days because you thought a cut you saw on a magazine model will suit you better? You can hide your "negative trim" under a cap. Good luck with badly defined brows. There are 6 basic face shapes out there; we all come under these in some form or fashion. We will give each due consideration. 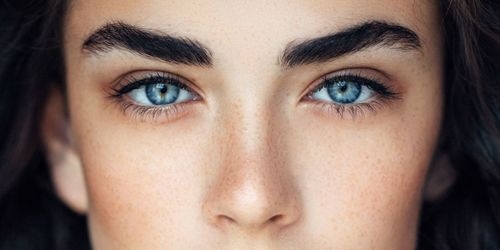 You do not need a longer looking face than you already have, so avoid arched eyebrows and go for rounded ones instead. A flat brow – with or without a slight down curve – is an excellent choice to make your face seem wholesome rather than stringy. This is quite the opposite from long face brow shaping. High arched brows with sharp or soft arches are great choices. Round brows + round face = terribly unattractive. This shape is a makeup-artist’s dream come true. Oval faces enjoy versatile shaping options, especially soft arches. There is a world of diversity in the soft-arch department. Never go for sharp arches, they only make you seem – unless it’s Halloween – witchy. An elegant square-jaw look can come across as strong, even masculine. Feminize it with some rounding off at the eyebrows. A low soft arch with medium thickness is a great selection, but keeps it medium, not thick or thin. A pointy chin determines this face shape, and a rounded brow (specifically a low arch round brow) will beautifully accent your look. You want to keep it natural. A sharp arch, on the other hand, will suit those with unusually short heart-shaped faces. 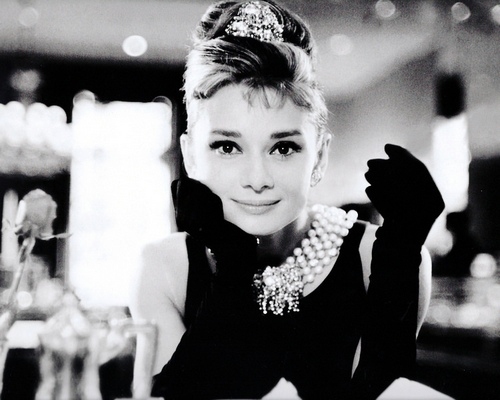 Wide sometimes strong cheekbones fulfill a diamond face-shape. A curved brow will do wonders to glamorize your overall look. What about waxing, you ask? If you have sensitive skin, opt out. 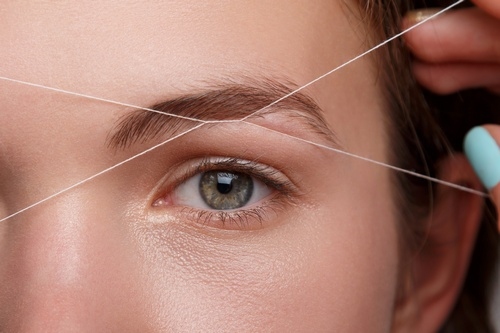 Threading is better because it does not stretch or pull your skin like waxing does. Remember the pain when you pull off that strip? That’s because the uppermost skin layer comes off with each waxing. Scary, and you want to do this to your face, especially your eyebrows? If you happen to be someone who uses topical (external application) or oral (intake) skin-thinning products like Renin-A, threading adds to the value of eyebrow shaping. Capable of pulling out even the smallest hairs (which is great if you have coarse dark brows), threading comes out on top. Devoid of chemical use, threading is supremely hygienic. So much so that you will experience no breakouts of acne or pigmentation. One of the best benefits about learning how to thread your eyebrows is that hair takes longer to grow back. This keeps your brows less dense before you are called to repeat the steps detailed above. Server responsed at: 04/19/2019 10:50 p.m.